In one of my OCA photography course blogs about panning I light-heartedly referenced the old cliché that “the camera never lies” in reference to a crop I used on one of the photographs. 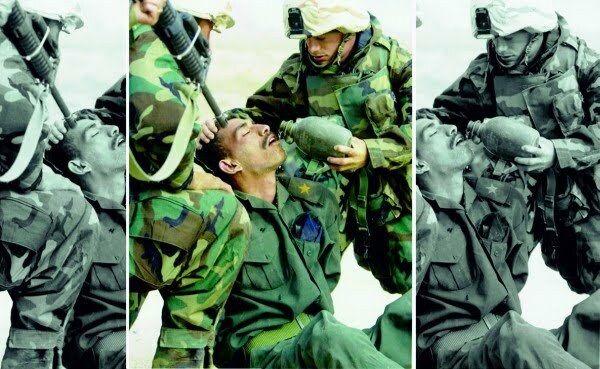 This got me thinking back to a blog post on EU Referendum I read back in June about how cropping has been used by news agencies and papers to imply a different meaning to a picture than the opinion one might form if viewing the original image. Take, for instance, the following picture. What do we read into the fact that we see a soldier holding his gun to an adversary’s head? We might even conclude from this picture that the opponent is possibly about to be executed against international law? OK, so it’s not the nicest image and it leaves thoughts in one’s mind that we would rather not have. So how about this picture? The adversary is the same but our reading of the picture is completely different. What we now see is the seated man being given water by another soldier. We might conclude from the difference in uniform and the position of the seated man’s arms that he and the soldier with the water bottle are opponents in a war. Even though they are adversaries what we can definitely conclude is that, in spite of being on opposite sides, the captured soldier is receiving aid from his adversary. Only the final picture, below, gives the full story. Yes the opponent has a rifle muzzle at his head, but seeing the whole picture allows us to immediately see that he is not about to be summarily executed as implied by the first crop. This is probably a typical scenario in many conflict situations and one that shows that, whilst adversaries may fight, compassion is shown to opponents once they are captured. Cropping is a great tool and one that as a photographic artist I use on numerous occasions to fine-tune my pictures so I am not in any way suggesting that it should not be used – just that we should treat with caution some of the images we see on the news. I intend to post on this subject in the future as I pick up on examples of this. If you have any good examples please send me links and I’ll add them to the series. Thanks. This entry was posted on Tuesday, July 27th, 2010 at 09:45 and is filed under Blog, The camera never lies. You can follow any responses to this entry through the RSS 2.0 feed. You can leave a response, or trackback from your own site. Welcome to studying with the OCA. Your images above are a very good illustration of your argument. This is a major area of debate in the OCA photography forums. I have pasted below a bit of text from a discussion about a month ago that you might find interesting. The tragedy of young woman's death is presented to us in the second image as a commodity, like air freighted exotic flowers, to be got to market as quickly as possible to maximise its value. Thanks also for the links. It's an interesting and disturbing story. I agree with your point about the how the image is presented as a commodity. On balance I think (and I hope that most people would agree – photographers or not) that it is crucial we see these images even if the tragedy we see has become commoditised. Without these images there are many things that we simply wouldn't learn about. The other issue your comment highlighted was the fact that the second image has not (to your knowledge) appeared in the UK press/mainstream media. I firmly believe that we are now in a world where increasingly we will only find the 'non sanitised' version of the news in the blogosphere – but that's a whole other discussion.